DYCUSBURG, Ky. -- As a stretcher carrying Andrea LeFan was moved toward a waiting helicopter, her mother recalled saying, "You're gonna be OK. You're gonna make it." But those turned out to be the last moments Jamie King would see her 16-year-old daughter conscious. A Trans Am speeding down a winding road in Western Kentucky had struck Andrea's Chevy head-on. With no nearby hospital able to handle her injuries, she was airlifted to Deaconess Health System in Evansville, Ind., arriving 80 minutes after the June 5, 2006, wreck. A team of doctors struggled to save her. But it was too late. "If she were hurt in Louisville, it is very possible she would have lived," said Dr. William Barnes, a Western Kentucky physician who examined her medical records. "But she definitely had no chance where she was." Kentucky voters have only a few days left to decide which side of the political coin they want to influence for next year's Presidential election. Though the primary election is still five months away, any registered voter wanting to change party affiliation for the May 20 vote must do so by the end of the year. That primary will help choose party nominee for the next Commander-in-Chief to replace President Bush. Kentucky primaries are closed, meaning voters can only cast a ballot for candidates within their party of registration. And, only voters registered as Democrat or Republican will be able to vote. The deadline for changing party alignment is Dec. 31. Crittenden County Clerk Carolyn Byford's office will be open to take voter registration changes. 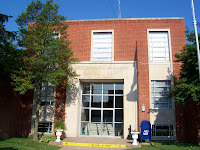 Though Byford's office will close for 2007 on Dec. 28, requests for a party change can be mailed but must be postmarked by Dec. 31 to be accepted. Registration cards can be picked up in Byford's courthouse office or downloaded at elect.ky.gov/register.htm. New voters, including 17-year-olds who will be 18 by the general election on Nov. 4, can register to vote in Kentucky's May's primary until April 22. Besides next year's Presidential Election, Crittenden County voters will help choose a U.S. Senator, congressman and state representative. Potential primaries loom for all partisan races. Reprinted with permission from The Crittenden Press, Dec. 20, 2007 issue. Several planes fly near Dycusburg during the day, but as no large commercial airport is near Dycusburg (Paducah is near, but not large), the planes are often at their cruising altitudes of 34,000 or 35,000 feet, more or less. I was flying to Dallas earlier in the year on a US Airways flight, seated next to a pilot who was traveling as a passenger back to his home in Oklahoma. 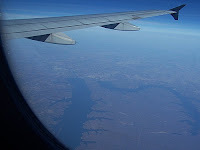 During the flight, he leaned over and said, "We are over Land Between the Lakes." I looked out, and lo and behold, I was able to figure out Dycusburg's location, following the river. Attached is a photo similar to my view out the window. The flight I was on was more north, closer to Dycusburg. I recall another time I saw Eddyville when I was flying from Detroit to Memphis.